The Latest in Celebrity News, Red Carpet Moments, Viral Videos and Breaking Celeb Rumors! : Ratchet: Beyonce,Lady Gaga, Azealia Banks? Ratchet: Beyonce,Lady Gaga, Azealia Banks? 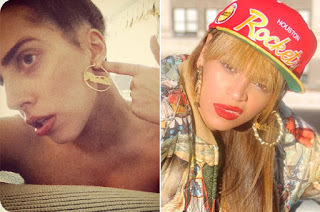 Will Beyonce be collaborating with Lady Gaga and Azealia Banks for a Ratchet single....Read more for info! On Dec. 30, Bey posted a photo wearing "Ratchet" bamboo earrings . A camera, which hints at a video set, is just barely visible to her left in the photo. The day before (Dec. 29), Bey posted the earrings alongside a pair of purple printed flats. Will "Ratchet" be the title of the first single off her forthcoming fifth studio album? Or, even better, will it be a collaboration with Lady Gaga and Azealia Banks? Gaga, who rocked her own "Ratchet" hoops on Instagram in November, revealed in an October web chat that she had finished a song of the same name, featuring Azealia Banks. Either that song or another track, "Tea," will likely be released in January as the lead single from Gaga's upcoming album, "ARTPOP," the singer revealed on her fansite, LittleMonsters.com. Banks told Brazil's Mix TV in September, "I worked with Lady Gaga, but I worked with Lady Gaga from afar. We worked via email and via Internet. We have a song called 'Red Flame' and a song called 'Ratchet,' but I don't know what she's doing with it. She's going to release it when she wants to release it." And During an interview with ASOS ,Azealia revealed she had worked with Beyonce too. Do you think this collaboration really exist? Dont forget to comment!